On most maps, Big Sur is merely a small village along Highway 1 close to the Pacific Ocean in the foothills of the rugged Santa Lucia Mountains, though the name is more widely applied to a 70 mile section of the central California coast, from Carmel in the north southwards to San Simeon - for all this distance the hillsides slope steeply down to the ocean forming a seemingly endless line of sheer cliffs, rocky coves and sandy beaches. Apart from a few miles near Pfeiffer Point, the highway follows right beside the ocean, sometimes at water level, in other places rising quite high above - rounding steep promontories and bridging deep canyons - making this one of the most famous and scenic drives in the state. The Pacific coastline north of San Francisco is also very impressive, but it is less accessible and some parts are more developed. 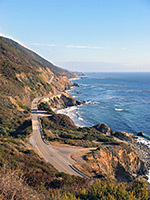 The Big Sur coast has few facilities, and only one through road leads inland for 101 miles of Highway 1. However, despite the many bends, occasional steep sections and shortage of overtaking places, the highway is a good route that can be driven in around three hours though a day is more normal, to allow stopping at the many overlooks, beaches and trails, many of which are within nine state parks (see below). In the north, Big Sur begins near the affluent town of Carmel-by-the-Sea, where the flat grasslands around San Jose Creek give way to the rocky cliffs of Point Lobos, regarded by some as the most beautiful place on the whole coast. Just south are more expensive houses at Carmel Highlands, the last major town en route, then the mountains rise to the east and the dramatic roadside scenery begins. 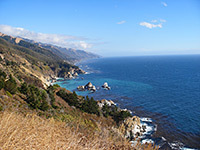 A fair amount of the coastline is inaccessible, either due to the steepness of the cliffs or because the land is privately owned, so the main visitor locations are the state parks, which are concentrated in the northern half of Big Sur as this has the best scenery - the mountains become slightly less steep further south and begin a little further inland. Although the whole coast is in general very little populated, there are quite a few luxury homes in the thin belt of land between the road and the ocean, most well-hidden behind gates and patches of woodland, some with private paths down to secret coves and all with uninterrupted views out west over the Pacific. Approximately half way along the Big Sur coast, the narrow, twisting Nacimiento Fergusson Road provides the only route away from the ocean, eventually linking with US 101 on the east side of the mountains after 47 miles. The first part climbs steadily gaining 1,500 feet, affording fantastic views over the ocean and many miles of the coast, before turning inland into thick woodland. After reaching a National Forest campground, the next 25 miles of the road runs through Fort Hunter Ligget Military Reservation passing tanks, humvees and land damaged from firing practice; the road may be closed for a few hours during army exercises though most of the time the public may travel unescorted after passing through a checkpoint. 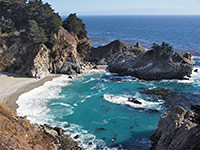 Although a few lodges are found scattered along the coast, the main places for hotels are at the north and south ends of Big Sur. Towns in the north include Carmel, Monterey, Pacific Grove, Seaside, Marina and Salinas. In the south, the closest towns are Cambria, San Simeon, Paso Robles and Morro Bay. Camping is only allowed along Highway 1 at official sites in five of the state parks (Andrew Molera, Pfeiffer Big Sur, Julia Pfeiffer Burns, Limekiln & San Simeon), though the Los Padre National Forest has many primitive camp sites, reached by driving a few miles along several narrow roads that climb eastwards into the mountains, principally the Palo Colorado, Coast Ridge and Nacimiento Fergusson roads. The first two of these are paved for a few miles then deteriorate a little. Free camping along the roads is generally permissible once across the national forest boundary. 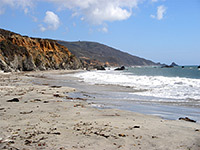 There are nine main preserves along the Big Sur coast, plus one state beach at the north end. Carmel River State Beach - just south of Carmel-by-the-Sea, the Carmel River flows past a shallow lagoon that provides sanctuary for many species of birds, then meets the ocean in the middle of a mile long stretch of sandy beach, good for picnics and sunbathing though less so for swimming/wading due to the strong currents, high surf and cold water. Access is from a layby on Highway 1, near the south end of the beach, and there is no fee to enter. Point Lobos State Natural Reserve - a mile south of the Carmel River, the coastline rises to form a narrow, rocky promontory (Point Lobos) with varied wildlife, thick woodland, pretty coves and small islands, once described as 'The Greatest Meeting of Land and Water in the World'. Several roads and paths cross the point, for which vehicular access is $8 but pedestrians enter free of charge. Garrapata State Park - as with Point Lobos, the centerpiece of Garrapata State Park is an exposed promontory, this time without much covering vegetation, but the park also contains quite a large section of the inland hills, and has several paths climbing high above the ocean. It extends several miles southwards to include one of the best beaches on the whole Big Sur Coast. Access is free and convenient, from 12 roadside parking areas. Point Sur State Historic Park - Point Sur is formed by an isolated volcanic rock at the edge of an otherwise flat, grassy section of the coastline, and is reached by a short side road off Highway 1. In 1889, a lighthouse was built on top of the rock, and was staffed continuously until 1974 when its operation was automated; the installation is still in use, now featuring in the National Register of Historic Places, and forms the main attraction of Point Sur State Historic Park, along with two sandy beaches at either side. Andrew Molera State Park - Highway 1 moves inland for a few miles to avoid the especially steep oceanside cliffs of Pfeiffer Ridge, most of which falls within a large state park named after Andrew Molera, who once operated a ranch in this area. The park also features a long sandy beach, the lower end of Big Sur River and a sizeable area of the higher mountains east of the highway. Pfeiffer Big Sur State Park - although small in area, Pfeiffer Big Sur is a popular park despite not being close to the ocean; it covers several miles of land alongside Highway 1 in the forested canyon of the Big Sur River, and contains a lodge, restaurant, several stores, a large campground, two waterfalls and a network of hiking trails into the woodland, which includes several groves of coastal redwoods. Just south of the park, the narrow Sycamore Canyon road winds through the woods for 2 miles right to the shoreline at Pfeiffer Beach, a beautiful, hidden stretch of golden sand. Julia Pfeiffer Burns State Park - another large park that commemorates a pioneer of the Big Sur region, Julia Pfeiffer Burns SP has 3 miles of inaccessible coastline, a campsite and several trails into the mixed oak/redwood woodland covering the hills east of Highway 1. The main attraction is California's only coastal waterfall, falling 80 feet onto the sand at McWay Cove. 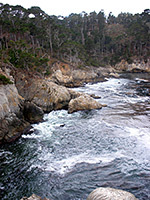 John Little State Reserve - the least-known Big Sur park contains a short section of cliffs and bluffs around the lower end of Lime Creek, west of Highway 1 and just south of the Esalen Institute buildings at Slates Hot Springs. There are no trails or facilities. Limekiln State Park - Limekiln is a small state park, not marked on some maps, that contains a small section of the coast plus a few miles of Limekiln Creek and the adjacent redwood forest. At one point the creek tumbles down a limestone cliff face forming a 100 foot waterfall, which may be reached by a one mile trail that starts from a 33 site campground beside the highway, and also passes various remnants of lime extraction activities that took place in this area during the late 19th century. 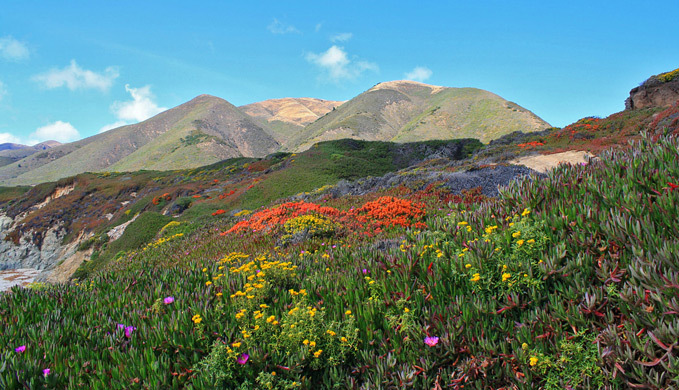 San Simeon State Park - a sandy beach, coastal hills and the valley of Santa Rosa Creek are the main attractions of San Simeon State Park, located 4 miles from Cambria at the south end of Big Sur. A 3.3 mile trails winds through the hills, while other paths give access to the shore.